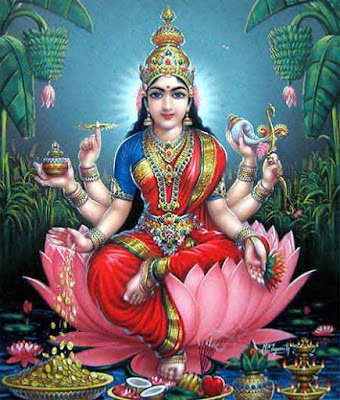 Shri Lakshmi Panchami, also known as Shri Panchami and Shri Vrata, is dedicated to Goddess Lakshmi, the Hindu goddess of wealth, prosperity and auspiciousness.. Shri Lakshmi Panchami 2019 date is April 10. Laxmi Panchami is observed on the fifth day during the waxing phase of the moon in Chaitra month – Chaitra Shukla Paksha Panchami. The day is also observed as Sri Panchami by certain communities in South India. Shukla Paksha Panchami, or the fifth day during the waxing phase of moon, is considered highly auspicious in many regions in Western parts of India, especially in Goa and parts of Maharashtra. Houses, shops and business locations are neatly cleaned. First offering is made to Ganesha. Lamp is lit using pure cow ghee and five wick is preferred. Then Goddess Lakshmi is worshipped by offering white color flowers. White color sweet is prepared on the day. Five items like honey, ghee, yogurt, sugar and milk is kept before Goddess Lakshmi. Offering five grains, five metals and five colored powders are considered highly auspicious. Performing annadanam (food donation), visiting Goddess Lakshmi temple, distributing cloths and books are considered highly meritorious. Goddess Lakshmi is known as Chanchala, quick on her feet. She leaves a household if there is no cleanliness, constant bickering and lack of faith. To make her Achala, sedentary, she needs to be worshipped quietly. External cleanliness and internal cleanliness is what keeps her fixed in a spot. It must be noted here that Basant Panchami which is observed during Magh Shukla Paksha Panchami, or the fifth day during the waxing phase of moon, is also known as Sri Panchami. Sri is used to refer both Goddess Lakshmi and Goddess Saraswati.